Stores 80,000 data points for each sensor. 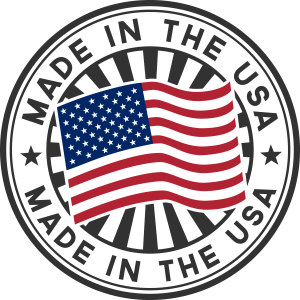 Sensors: Temperature only; temperature/humidity; extreme temperature; pressure. Remote sensors: wired or wireless. Text, email and/or phone call alert option. Each display has its own wired Ethernet connection. Internal alarm (audible and visual). No maintenance or monthly charges. Logs and charts all sensor data. Easy-Touch™display for easy setup and use. Each sensor has its own unique high low alert points. Uses digital, thermistor, thermocouple, and pressure sensors. Mix and match any combination of sensor on one display. View environmental conditions from anywhere. Operates as stand alone device or part of LAN. Traditionally data loggers have been small single purpose devices which record data over time. They have, in the past usually been battery powered and were designed to be programmed, turned on with a computer, left in place for long periods of time where they operated unattended, collecting and storing data electronically. A distinction can be made between a data logger and data acquisition equipment which is generally tethered to a computer which operated as a controller and a storage device for one or more sensors. Now with changes in technology many hybrid devices have entered the market so the user is able to pick and choose the device and features it has. The TV2 combines the features of data loggers and data acquisition equipment introducing a flexibility which has hitherto been unknown. The TV2, in addition to having the functionality of data loggers, and data acquisition equipment, also acts as an alarm and monitor with multiple sensors. 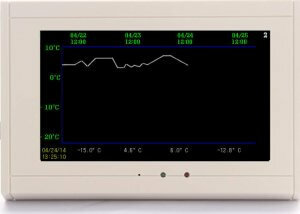 It can operate as a stand-alone data logger or as a front-end data collector for a computer or network. Its four sensor connections makes it a sort of data collector storing all the logged data in its own memory. But it can also automatically pass the collected data on to a PC, creating data files on a hard drive somewhere in the network. Since the TV2 has an Easy-touch display the user can interface with it directly, setting alarm points, viewing the logged data as full-color charts, changing settings, etc… all without the need of a computer front-end. Although the TV2 is powered with wall power its internal backup battery ensures that the TV2 continues to operate even during power outages. The TV2 Stores Over 80,000 Data Points for each of its 4 Sensors! The TV2 sensors are remotely mounted from the TV2 monitor for flexibility. Each monitor can be configured for wired or wireless sensors. Wired Sensors: Up to four sensors can be positioned hundreds of feet from the display. The TV2 monitor receives a new temperature from each sensor ever four seconds and displays it on its LCD disply. Wireless Sensors: Four wireless sensors can be used, with a range of over 60 feet, clear line-of-sight. These can be temperature only, extreme temperature or temperature/humidity sensors. Each sensor transmits the temperature data to the internal base station every few seconds where it is displayed on the Easy-Touch™display. 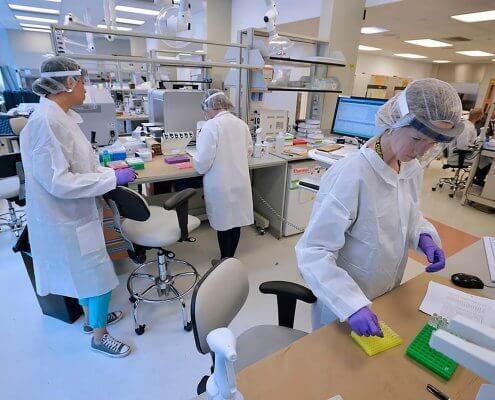 Each sensor, regardless of whether it is wired or wireless, is continuously logged. 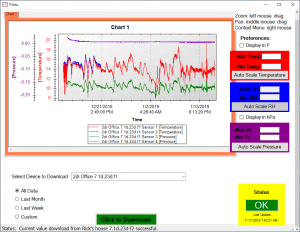 The logged data is stored in the monitors non-volatile RAM memory and can be displayed as a temperature history chart on the digital display of the TV2 monitor. All temperature data can also be downloaded to a PC that is on the same Local Area Network as the TV2 monitor. Once the data is downloaded, either continuously or on-demand, it can be printed our as a color chart, exported to an Excel Worksheet or archived on the computer. The TV2 sensors are remotely mounted from the TV2 monitor for flexibility. Each monitor can be configured for wired or wireless sensors. Each sensor is continuously logged. 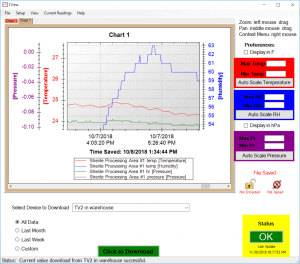 The logged data is displayed on a digital chart on the TV2 monitor and can be downloaded to a PC on your Local Area Network for printing or archiving. Wired Sensors: Up to four sensors can be positioned hundreds of feet from the display. Wireless Sensors: Four wireless sensors can be used, with a range of over 60 feet, clear line-of-sight. The sensors transmit the temperature data to the base station every few seconds and displayed on the Easy-Touch™display. Historically data loggers were small independent devices which had to be pre-programmed and then positioned in the area where the user wanted to track temperature. This worked great for remote areas where electricity was unavailable and there was no need to view the data until some time in the future. But if you wanted to see the data you had collected immediately or actual receive an alarm if the temperature became unsafe you were out of luck. used completely stand alone or it can be attached to a network so that the data can be viewed by any computer device on the network. 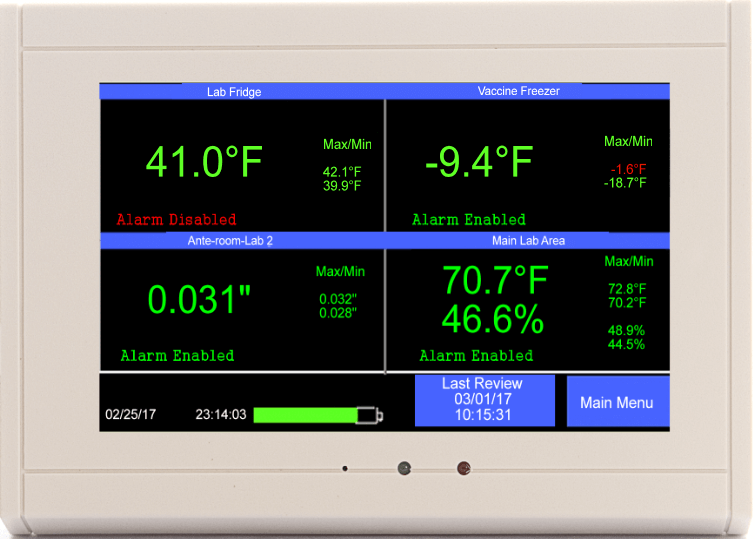 Since the TV2 has an Easy-touch display the user can interface with it directly, setting alarm points, viewing the logged data as full-color charts, changing settings, etc… all without the need of a computer front-end. Its backup battery continues to operate the TV2 even during power outages. 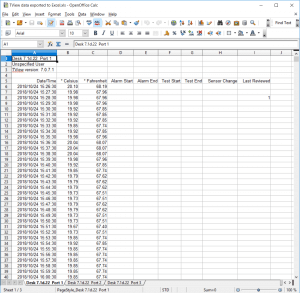 All logged data can be downloaded to a PC for viewing, printing or exporting into an Excel worksheet. Years of data can be viewed on one chart. Data can be zoomed into to highlight particular areas of interest. It is easy to zoom into even one logged entry or to zoom out to view a month of data or even two years of data. Multiple sensor data can be viewed as easily as just one sensors data on one chart. The TV2 stores over two-years of data if it is logged every 10 minutes. If data is logged once an hour over 12-yrs of data will be kept for each sensor. The TV2 monitor has a two stage alarm. The first stage triggers a local visual alert by changing the color of the variable from GREEN to RED and starting a watchdog timer. Once the delay time is exceeded the second stage alarm sends text and email messages as well as initiating the local audio and visual alarms at the TV2 monitor. The N/O dry-contact relay also closes, which triggers an optional auto dialer, external local alarm, or even the building alarm system. Optional multiple number auto dialers and local alarm are available for the TV2. The free secure PC interface software, TView, enables the logged data to be copied and archived on any computer on the same Local Area Network. 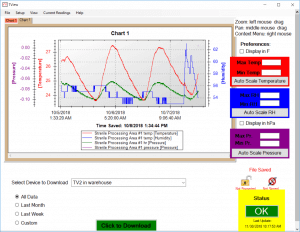 The same TView software can be used to automatically copy the sensor data to a PC as it is collected. This not only creates a backup but enables the data to be viewed from any computer on the same network. In addition to seeing the chart for each sensor on the display, once downloaded to a PC areas of interest can be highlighted and zoomed into to see what happened to the temperature, humidity or pressure over the last month, week, weekend or even hour. Each individual reading will be shown if the mouse cursor is positioned on that reading. Last reviewed date and time.